Open her door. Allow her to go before you. Think ahead for things she may want or need. Put her happiness before yours. © 2016 Gentleman’s Notes: characteristics I want my son and son-in-law to see and learn by watching me by Mark Johnson. All Rights Reserved. Today was a scorching hot day in Texas. I knew where her car was parked because we had driven to work at the same location. I had a key, so I told my son, “let’s go get your Mom’s car, cool it off and take it to her.” He was pretty impartial to the idea as he expressed how much more important it was to discuss what happened after she received her car – taking him to the playground. I had inquired to find out when she would be leaving the building. My son and I went to her car, cooled it down and drove to the curb to deliver her car. 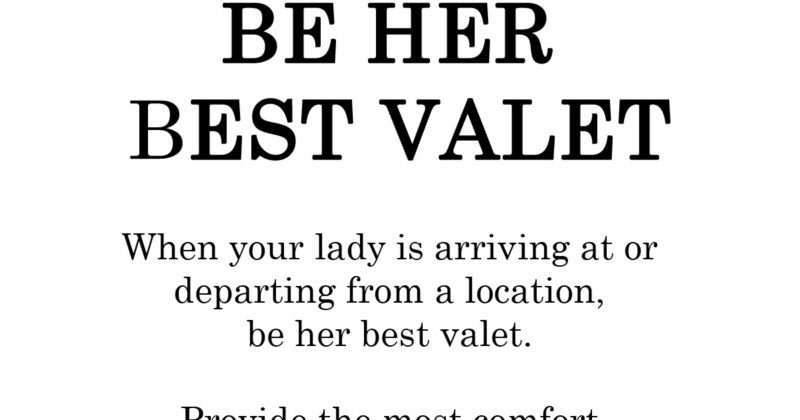 When your lady is arriving at or departing from a location, be her best valet. Provide the most comfort and safety possible. If she is driving separately from you, always make certain her vehicle is equipped and ready-to-go.